Some fab com­po­si­tions from that link Jack! Thx for sharing. Fol­lowed the link from Darwin’s web­site. I think that tilt shift is THE Way to go for a land­scape pho­tog­ra­pher ! its like using the old large for­mat camera’s on a mod­ern cam­era. thanks for this super pod­cast ! Thanks again for this extra awe­some piece of infor­ma­tion Evan! Haul it into Google trans­la­tor if needed. The folks at Mirex don’t have a per­fect com­mand of the Eng­lish lan­guage, but it’s miles ahead of my Ger­man. If you have any ques­tions, just zip them an e-mail. And they now accept Pay-pal, which is a lot eas­ier than their pre­vi­ous arrange­ment via the banks. No prob­lem. Here they are. I should also men­tion that the Zork has an ungainly screw mech­a­nism that makes the unit and cam­era dif­fi­cult to pack in a lim­ited space. That’s great info Evan — Thanks so much for shar­ing it. Just curi­ous might you also have exact links for the Zork and Mirex adapters? I received a Mirex tilt-shift adapter from Ger­many a cou­ple of weeks ago (to use my old Mamiya man­ual focus lenses with a Canon 5D). I was very impressed with the build qual­ity (much bet­ter than the Zork shift adapter which I also ordered), price (about $500) and func­tion­al­ity. The tilt has gra­da­tions marked on it and a screw for adjust­ing the fric­tion on the mech­a­nism. The shift has click stops at the mil­lime­tre marks. http://evanbedford.com/gx680.htm I’ve included some shots I did with the tilt at the link above. I even used a Mamiya shift lens on the shift adapter, which really boosts the shift to lev­els more typ­i­cal with view cameras. Superb pod­cast Marko. I’ve been dream­ing about that Nikon 24mm Tilt-shift lens so it was great to hear Dar­win and you dis­cuss the in & outs of using a TS. Fan­tas­tic pod­cast. Dar­win is an amaz­ing teacher. I had never thought of get­ting a tilt shift lens but now I might just do so. im not really famil­iar with the tilt-shift. but thanks. you just gave me an idea on how that actu­ally works. 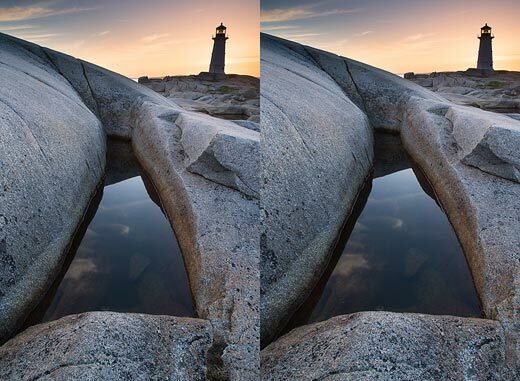 the out­come of the photo is bet­ter than using the reg­u­lar angle lens. thanks for shar­ing your ideas. Thanks for the com­ments Guys — and Yup, Dar­win Rocks! Great Pod­cast. I too have been on work­shop and at sem­i­nars with Dar­win. He is one of if not the best land­scape pho­tog­ra­pher around. This is another exam­ple of him shar­ing his knowl­edge and tal­ent with the rest of us. Again great pod­cast, keep them coming. Hi, yet another great pod­cast Marko! I have never been very famil­iar with tilt-shift lenses, the only thing i knew about them was the miniature-model effect. I have always thought post-processing in pho­to­shop could cre­ate the same effect. But after see­ing the sam­ple pho­tos for this pod­cast and lis­ten­ing to Dar­win Wiggett i realise that there is much more to these lenses. Too bad they are so expen­sive! Would have been fun to play around with one once in a while.